The “Golden Girls”—a gaggle of four crazily talented drag queens–began performing episodes of the successful TV show 9 years ago. They started in the parlor of a Victorian mansion that they quickly outgrew and continued to move through several venues before landing at the Victoria Theater in the city’s Mission District. This holiday season they are premiering two new episodes: “From Here To The Pharmacy” and “Journey To The Center of Attention.” Each episode is presented true to form, as the original TV scripts were brilliantly written, and each takes predictable liberties that you’d expect from a production that is this flamboyant. “From Here To The Pharmacy” finds Blanche (the incomparable, Matthew Martin) in a pickle. A soldier returns from the Persian Gulf War (Manuel Caneri) that she has no memory of, but clearly made an impression with. He is ready to collect on the promises Blanche made to him in the heat of passion before leaving–if only Blanche could remember his name. Although her housemates try to help her out, Sophia (Cookie Dough—really!) is busy with Rose (Pollo Del Mar—I kid you not) trying to help write her will. If only Rose had the wits to take on such a task. Meanwhile, Dorothy’s (Heklina) perfect deadpan deliveries and slothenly movement from couch to chair keep the whole episode humming along with her dry sense of humor. Talent runs along the lines of the biggest wig to the smallest, with Matthew Martin and Heklina sporting the biggest. In fact, Martin is a real talent and sparkles up the stage with such great timing, over the top nuance, and emotional, gut-wrenching double entendre, that if you don’t notice, he will make sure that you do! Was that really a tear? In “Journey To The Center of Attention,” Blanche is devastated when Dorothy rises to stardom at the “Rusty Anchor,” Blanche’s bar of choice. This tension allows for some campy sing-offs as the men of the bar shift their loyalties from Blanche to Dorothy. No longer in her homey nightgown, Dorothy brings down Blanche before a friendly (as friendly as two drag queens get) resolution and the love between them starts to flow again. Back home Sophia decides she can’t wait to be dead to hear the nice thing that people will want to say about her, so she stages her own wake. Rose who is her event planner forgets to inform the grieving guests that in fact, it’s just pretend and causes great alarm among those in attendance. “Golden Girls: Christmas Episodes” is the perfect vehicle for discharging the heavier emotions that the holidays can churn up and will instead have you “ O’er the fields we go, laughing all the way…” as you sing Christmas carols in between set changes. You can also feel the freedom to sing out of key the original Golden Girl theme song en masse–which apparently everyone in San Francisco knows. 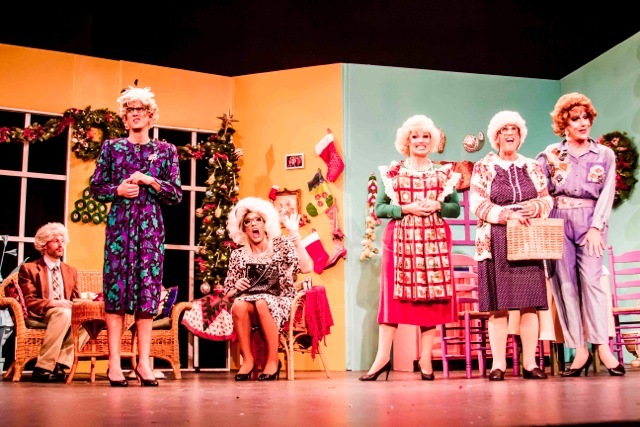 Plus, be surprised by different guest appearances made in a cameo role per show, and be willing to get your picture taken on the stage with the “Girls” which is even more fun than sitting on Santa’s lap. If you’re really lucky, you’ll be able to get a ticket before it sells out, which is part of this holiday extravaganza and annual tradition.